March must truly be Month of the Mini Quilt this year! This month's challenge for the Island Batik Ambassadors is to make a Mini quilt using either foundation or english paper piecing, and QuiltShopGal is having a Precision Piecing Quilt-Along. 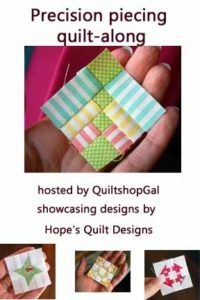 Plus that Aurifil thread has a contest to make a Sew Many Colors mini quilt with Kaufman's Kona fabrics. I love miniatures, so am definitely having fun with these, and have tons of great ideas going through my head - just need more sewing time to have fun with them! I have made a couple of the Mini blocks for the Precision Piecing Quilt-Along. They are so tiny and cute! They are not paper pieced, just regular traditional piecing! I used one of my Island Batik Stash Builder rolls for these cutie blocks, but they aren't for my challenge. 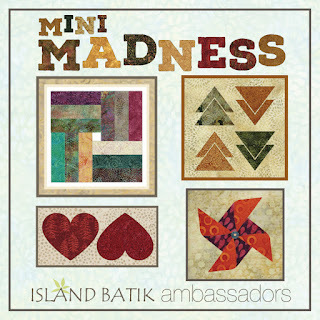 My challenge is using the pattern for Sew Many Colors, but using Island Batik fabrics. It's coming along wonderfully! Batik fabric is wonderful for paper piecing because it presses so crisply. I'm going to love hanging this little quilt by my sewing machine for sure! Today's agenda is working on black dresses from Ponte knit for a local Choral group. Not exciting so much for me, but the ladies are really excited to have some nice competition dresses, so that makes it kind of fun for me. I'm just glad to feel well enough to do more sewing finally! Those minis are awesome. I hope to try them soon. I'm working on my EPP for March.